One of the skulls, recovered at Thirukkeatheesvaram mass grave in Mannaar had its mouth wide open bearing marks of torture injuries in the mouth. Four more human skeletons were located on Thursday, when exhumation resumed at the site. The SL police at the site blocked Tamil physician from Mannaar G Gunaseelan, who is an elected member of the Northern Provincial Council, from witnessing the exhumation. The Sinhala policemen sent him away from the site, news sources in Mannaar said. The exhumation was also scheduled to continue on Friday at the presence of Mannaar District Judge Ananthy Kanagaratnam and Anuradhapura Judicial Medical Officer D.L. Wydiaratna. 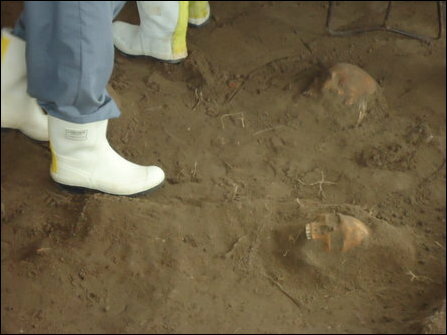 Since December 20 the mass grave has been exhumed 7 times and 36 human skeletons, including that of children, have been located. Some of the victims have been shot in standing position. A military camouflage bag was found covering the head of another victim. The victims are believed to be civilians who had been either abducted by the SL military or families who were trying to reach Mannaar from Vanni during the SL military operation of Rana Gosha in 1999.